A diamond pendant for on your necklace? Pure beauty and elegance! You will always leave a dazzling impression with a diamond pendant around your neck, irrespective of the occasion or dress code. From casual to black tie: the diamond pendant is the perfect accessory for any look. Which one do you like the most? Which diamond pendants can you find in our collection? Our varied collection includes numerous designs, shapes and colours. 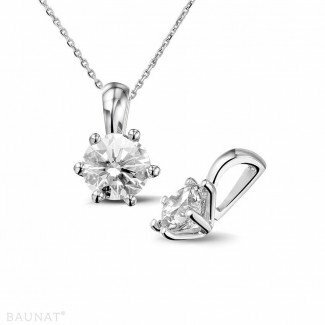 Would you prefer a solitaire diamond pendant? 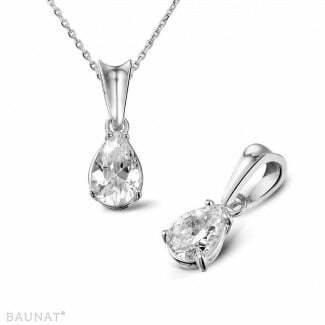 Or how about a diamond pendant with 3 stones? It goes without saying there are plenty of other possibilities too. Do you have a specific shape or design in mind? Contact our experts via phone, email or chat for extra advice. If you can’t find the diamond pendant you’re looking for in our existing collection, you always have the option of going for a tailor-made approach. Our experienced professionals will enjoy helping you realise your own creation. Which precious metal will you choose? Your diamond pendant belongs to a necklace. Have you opted for one in white gold, yellow gold, red gold or platinum? You can find diamond pendants in any type of precious metal, which will perfectly match your favourite piece of jewellery. 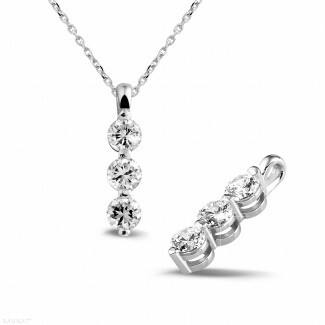 Would you like to complement your diamond pendant with matching earrings or other jewellery? Then make sure you check out the BAUNAT Designer Jewellery line. All beautiful and timeless collections, made by talented Belgian designers. 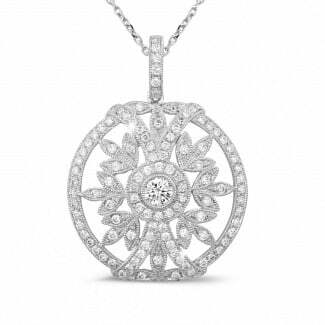 Where can you see your diamond pendant? You found the diamond pendant you were looking for in our online collection, but you’d like to see it from up close first? Make an appointment with one of our showrooms and enjoy some professional advice during a private visit.